George Chittenden is a national award winning storyteller. His debut novel 'The Boy Who Led Them' is described as 'Pirates of the Caribbean' meets 'The Godfather' and has an average customer review on Amazon of 5 stars. The young writer followed it up with another novel 'The Boy Who Felt No Pain' released on 30th August 2013. His latest novel 'The Man Who Met His Maker' is a dark pirate adventure about power, greed and revenge. The novel was released on 1st December 2015. As a kid he was always reading but he never thought he’d end up on the other side of the fence. George began writing around eight years ago whilst back-packing across Australia. His debut novel is George Chittenden is a national award winning storyteller. 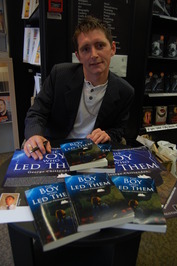 His debut novel 'The Boy Who Led Them' is described as 'Pirates of the Caribbean' meets 'The Godfather' and has an average customer review on Amazon of 5 stars. His debut novel is about a boy who is born into poverty but destined for greatness. Raised by a fisherman on the English Channel Jacob Swift knows the location of every dangerous sandbank and wreck hidden under her surface and as a result is recruited by a fearsome smuggler and trained to lead an army of the toughest men through some of the darkest times in our countries history. It’s a sweet story with a message and a great ending. George was inspired to write the book after learning about his town's fascinating and rather shady history. The book is best described as commercial fiction and will entertain the reader first and foremost, that’s George's primary intention. However he also hopes to raise awareness of our countries fascinating smuggling history and teach the reader something about the country they are from. As a reader George likes a wide range of genres and authors for many different reasons. His favourite books are The Stand (Stephen King), 20,000 leagues under the sea (Jules Verne), The Lost World (Conan-Doyle), A Brave New World (Huxley), Animal Farm (Orwell), The Sicilian (Puzo), and Capo (Watson). I read this book as a journalist recently compared it to my debut 'The Boy Who Led Them', which is similar only in the sense that it's a smuggling adventure. I really enjoyed reading Moonfleet. The novel had me turning pages at a rapid speed and was i I read this book as a journalist recently compared it to my debut 'The Boy Who Led Them', which is similar only in the sense that it's a smuggling adventure. We’d love your help. Let us know what’s wrong with this preview of Moonfleet by John Meade Falkner. "I got this book from a Goodreads giveaway. Thank you to the author George Chittenden. Just as the name implies, this group is about nautical fiction. do you think I'd be able to find your book in the Middle East? It sounds like a great read!" alternatively ordering it online on Amazon is a good bet. I hope you enjoy the adventure. I would like to thank you so much for the friendship request here on Goodreads. Your novel "the boy who led them" sounds utterly facinating, and if you would like someone to read & rev..."
Anyway I'm delighted to make your acquaintance. I look forward to hearing from you. do you think I'd be able to find your book in the Middle East? It sounds like a great read! I would like to thank you so much for the friendship request here on Goodreads. Your novel "the boy who led them" sounds utterly facinating, and if you would like someone to read & review it, i would be more than willing. I do write informative, honest reviews here on Goodreads and amazon websites - if you are at all interested? Thank you once again for the friendship and i look forward to keeping in touch online. Thanks for approving us as friends. I’m Gusto Dave Jackson, publicist for Rocky Mountain Fiction Writers and I wouldn’t be worth my salt if I didn’t tout our blog and organization. Chiseled in Rock http://chiseledinrock.blogspot.com features side-splitting satire and some flash fiction for intellectual readers. Wednesday on the Rock: A First Degree Black Belt in Shotokan Karate, a Fifth Degree Black Belt in Chito-Ryu, Matthew Swihart begins a series entitled Time for the Beatdown in which he talks about realistic fighting in prose. RMFW has several bestselling authors such as NYT Bestseller JEANNE STEIN and J.A. KAZIMER. You have an open invitation to the Rock for contests, entertainment, and an insight to the world of writing! Let’s follow each others’ blogs!